Eyecatching glamour, pretty faces, skimpy outfits and high entertainment value makes cheerleaders an important part of IPL. Here is sneak peek into their salaries. The advent of the Indian Premier League (IPL) provided a great platform for the youngsters to display their skills against some of the best cricketers in the world. The tournament also brought into the picture the cheerleaders in the game of cricket for the first time. During the course of every match, these cheerleaders, wearing skimpy outfits, display their scintillating dancing moves. Their job is to entertain the crowd and keep them engaged with the game happening in the middle. Ever wondered how much these cheerleaders earn during the tournament every year? Their earnings are based on per match salary and there is even bonus for appearing in various events and after their teams winning the match. On an average, they are known to earn Rs 6000 to Rs 12000 per match apart from bonus which they get after a team wins the match which is around Rs 3000. They also get paid around Rs 7000 to Rs 12000 for extra appearances like in opening ceremony etc. and for photo shoots. 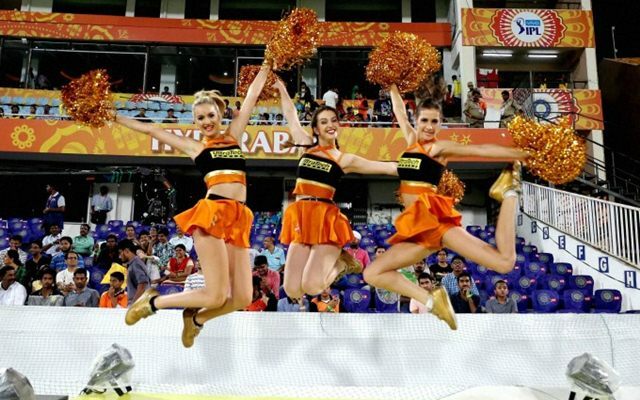 However, their per match salaries vary with every team and here we bring you all the details about the earnings of the cheerleaders of every team in the IPL. GMR Group owned Delhi Daredevils are yet to win the coveted trophy even after its 10 editions and are eyeing to triumph this year. Though their squad of cheerleaders have always tried to give their best to entertain the crowd and inspire their side. Usually dressed in the white short dress with blue stripes, these ladies earn around Rs 9700 for every match their team plays during the season. According to tsmsportz.com, their annual earnings go up to Rs. 2.5 Lakhs which is staggering. SRH has won the tournament only once in 2016 and is a force to reckon with ever since they’ve been playing in the tournament. Though the side is not star-studded, every time they’ve managed to entertain the crowd which gives an opportunity to the cheerleaders to make their moves. Though their outfit is slightly dull, the golden pom-poms which they have in their hand make it up for them. This team is owned by Kalanithi Maran of Sun Group. The team in red always promise to punch above their weight but they perform underwhelmingly every time. The franchise has managed to cover the entertainment factor the enthusiastic group of girls. They wear ditched shorts for comforting red full-length pants to keep up the high-octane intensity of atmosphere when their team celebrates after hitting every four, six or after picking up a wicket. They earn around Rs 9500 for every match and bonus is not applicable to them much like the aforementioned teams so far. RR are also returning to the marquee T20 league along with CSK this year and have also won the inaugural edition of IPL. But they have failed to play to their potential ever since then. However, their cheerleaders try their best to keep up the spirits of the spectators and their players by displaying dancing skills and gymnastic skills. For all the hard work they do, the cheerleaders of Royals get paid around Rs 11500 to Rs 12000 every match which takes their annual earnings up to Rs 3.22 Lakhs. MI is one of the most followed and successful teams in the T20 League. Their cheerleaders are dressed in blue and golden and are one of the most energetic and noticeable squads in the tournament. The franchise pays them around Rs. 16000 which is absolutely staggering and they also earn the bonus of around Rs 6500 if the team wins. Their total earnings are huge which go up to Rs. 8 Lakhs and is the second most among eight teams in the tournament. RCB is one of the most glamorous teams in the IPL with the superstars present in the team. Though they haven’t won the tournament even once, the franchise and team take care of the entertainment. They are dressed in red and if one of the players in the team goes gaga in any of the games, they have to dance non-stop sometimes. Probably, that is the reason the owners pay them the same amount as MI pay their girls. The only difference is the bonus and RCB cheerleaders are paid $ 50 after their team wins the match. When the employer of the team is the King of Bollywood and the most followed celebrity in the world, Shahrukh Khan, everyone is bound to get paid more. KKR pays the highest amount among all of their cheerleaders. K.K.R. Girls are specially taken care of by King Khan himself according to the reports in india.com and he also acknowledges their work. KKR cheerleaders almost earn Rs 20000 per match to go with the bonus of Rs. 6500 which takes their annual earnings in excess of Rs. 11 Lakhs.